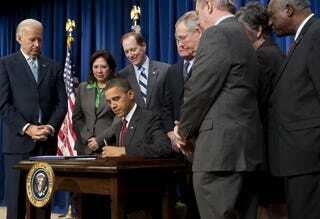 President Obama signs controversial bipartisan tax bill. MSNBC is reporting that the Congressional Budget Office is estimating that the U.S. budget deficit will be $1.5 trillion thanks to the weak economy and bipartisan tax-cut legislation passed last month. The CBO analysis predicts that the economy will grow by 3.1 percent this year, but joblessness will remain above 9 percent this year. The nonpartisan body also estimates that there will be a nationwide unemployment rate of 8.2 percent on Election Day in 2012, which does not bode well for President Obama. The latest figures are up from previous estimates because of bipartisan legislation passed in December that extended Bush-era tax cuts and unemployment benefits for the long-term jobless and provided a 2 percent payroll tax cut this year. That measure added almost $400 billion to this year's deficit, according to the CBO. The CBO is saying what economists and activists were saying when the tax cuts for the wealthy were passed. This is what happens when people who make the most money continue to avoid paying their share of taxes: You get a deficit. If nationwide unemployment stays above 9 percent, then what does that mean for African Americans, whose unemployment numbers are significantly higher? We're not too concerned with how unemployment figures will affect Obama's 2012 election. We suppose he knew the risk he was taking when he decided to choose making wealthy Republicans happy at the expense of the economy for years to come. We're more concerned with the impact it will have on black and brown families that are already struggling. In other news: Egypt: Thousands Defy Government Ban.